It may or may not be surprising but one of the best ways to make your house greener is to literally make it greener. Green roofs, or living roofs, offer a number of important benefits not only to the environment but also to home and property owners. And while many might think of green roofs as exclusively in the purview of commercial property, home installation is in fact both practical and economical. Green roofs are created by using rooftop space to plant a layer of grasses, shrubs, flowers, and other forms of flora and greenery. Typically, green roofs begin with an insulation layer, followed by a waterproof barrier, then by the organic material used to grow the plants. Construction and maintenance of green roofs is inexpensive and they can also last far longer than traditional roofs if the appropriate plants are used. Although green roofs have been catching on as a part of the growing trend to make our cities and buildings more sustainable, they are in fact nothing new. 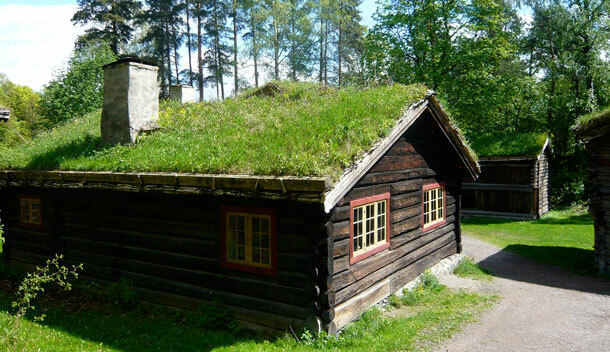 People around the world built their houses with roofs made of sod or grass for hundreds of years. Though those houses are now seen as relics of antiquity, their construction serves as useful inspiration to guide the design of the sustainable houses of tomorrow. The most obvious benefits of living roofs come from the fact that rooftop planting greatly increases the available amount of green space in any urban or suburban environment. Increasing the number of plants in these neighborhoods helps offset the amount of carbon dioxide emitted from these hubs of human activity. Furthermore, plants can effectively filter air and remove other harmful pollutants. In fact, a study from Michigan State found that installing green roofs should be an important component of our strategy to combat climate change. Urban spaces typically create what is called a “heat island,” a locale that is noticeably warmer than surrounding areas because of human activity and a lack of greenery. Green roofs, however, can abate local warming trends by cooling and humidifying the surrounding air. If used en masse, it’s quite feasible to think that green roofs could make significant contributions to cleaning and cooling the air we breathe. Green roofs can also lower pollution by decreasing the amount of water that runs off into drainage systems. Whereas rainwater usually collects in our water supply after picking up pollutants and contaminants along the way, green roofs store water and immediately recycle it for plant growth. Roofing houses with living material serves as a natural mechanism to recycle rainwater, circumventing the need for treatment. Homeowners can also benefit from installing green roofs. Properly constructed living roofs are excellent insulators and can therefore decrease heating and cooling costs. This not only leaves more money in the pocketbooks of those paying utilities but also makes homes more environmentally friendly by reducing the amount of energy used for climate control. Last, but not least, green roofs provide an exciting opportunity to change the aesthetic dynamic of homes, neighborhoods, and communities. Rooftops can become landscapes covered in a diverse array of flowers, grasses, shrubs—all of which can be sustained by the local climate. Adding to the portfolio of green space in neighborhoods can beautify communities, improving life for those who live there and visit. If you need to redo your roof—or are simply looking for a way to make your home more environmentally friendly—installing a green roof is a wise decision. You can save money on your utilities, help the environment, and beautify your home all at the same time. Best of all, with the availability of online guides, it’s possible for do-it-yourselfers to undertake a fun project and save money on construction costs. Or if you’d prefer not to, contact local contractors to see who has experience in the green roofing business.